Top Ten Best Restaurants in Ikeja Lagos - Your MOST Sort For List ! 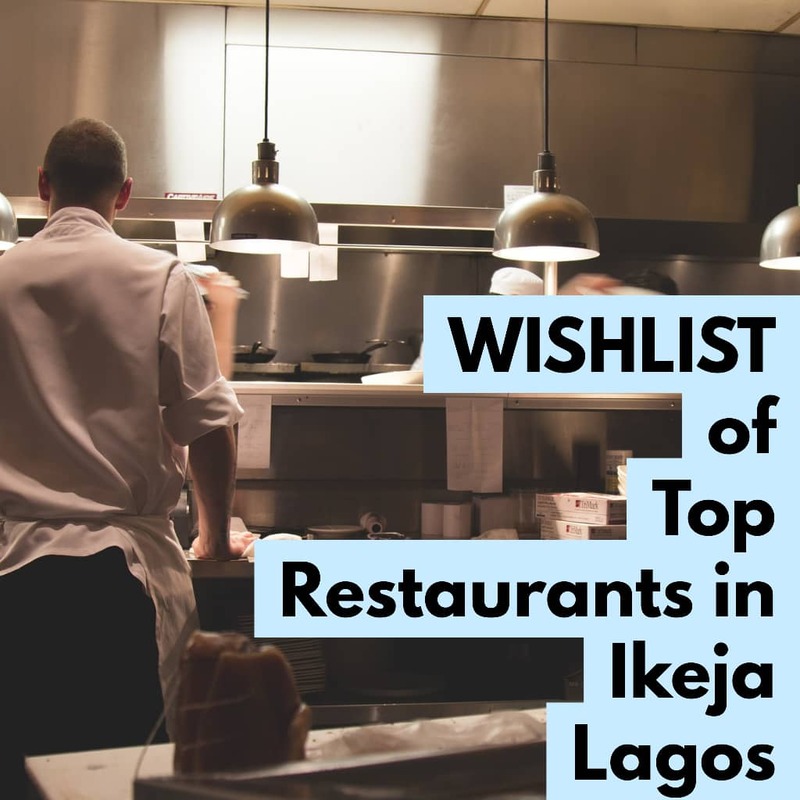 Restaurant services have now become part of a mega city setting and Ikeja is a place where you’ll get such big, fancy ones and we are interested in the best restaurants in Ikeja, Lagos. Wikipedia describes a restaurant to be a business which prepares and serves food including drinks to customers in exchange for money. Often, meals are generally served and eaten on the premises, notwithstanding, many restaurants also offer take-out and food delivery services, and some restaurants offer only take-out and delivery. Writing on Restaurants, precisely the Nice Restaurants in Ikeja and we’ll be highlighting the Top Ten Restaurants in the area. Ikeja is the Capital of Lagos state. Typical of all capital cities in Nigeria, Ikeja is a bustling business hub that accommodates the popular computer village, also the notable Murtala Muhammed airport and a lot of five-star hotels. Due to the presence of this high standard hotels when it comes to food, Ikeja is an amazing place to enjoy the sumptuous meal as there are numerous nice restaurants in the area to eat. Check out below Nice Restaurants in Ikeja as we list out the Top Ten Best Restaurants in Ikeja. Food is said to be created for the belly and the belly for food. There are Nice Restaurants In Ikeja as noted earlier and without further ado below is the Top ten best restaurant in the area. The Place Restaurant is where you enjoy a variety of delicacies that include swallow, rice dishes, Asian, grilled chicken etc. It has other branches of this restaurant in areas like Lekki and Victoria Island. The Place restaurant in Ikeja is not far from hotels like Regent luxury suites, Lagos Airport hotel, City View Hotel Ltd, Apartment Royale hotel and suite etc. Exactly by 5 pm every day the bar/lounge in the restaurant is opened except on weekends when it serves as a major nightclub where exclusive DJs and some couple of musicians deliver and give live performances of great hits. There are a variety of delicious homemade Nigerian delicacies to select from at Jevinik restaurant. The restaurant is close to hotels such as Wazobia Plaza hotel, Sheraton Lagos Hotel, Hotel Ibis Lagos Ikeja, Jerome Garden, and Suites. and this brings about high customer turn up. ₦1800 is the approximate cost of eating in this restaurant. In addition to its services, the restaurant offers delivery services. The restaurant has a warm ambiance which you will definitely enjoy and it’s in a good location as well. Address: 30 Mobolaji Bank Anthony Way, Sheraton Lagos-hotel, Ikeja. Crockpot Restaurant is an on-site eating place in Sheraton Lagos hotel. The price of food in this restaurant is a subtly high subtly but the food is of good quality and serving style is worth the price. The restaurant offers breakfast, lunch and dinner buffet at different prices. The price of the breakfast buffet is ₦6,500, that of lunch buffet is ₦7,500 and the price for the dinner buffet is ₦8,500. The restaurant offers special themed nights too and if you are lucky to be there at such nights, you will have the opportunity to savor continental delicacies ranging from the Mediterranean to Indian and American dishes. The Rodizio restaurant offers “buffet” menus as well as“A la carte” meals. It dishes and serves delicacies ranging from appetizing desserts, local dishes, seafood, and special barbecue meats. At Rodizio Restaurant and Bar, you will be served a variety of food at Rodizzio restaurant with ₦6000. The restaurant also has provision for live band entertainment and its description to be simply magical. Every Tuesday night, a Latina dance party is organized in the place; on Fridays, top-rated DJ reels out cool music at the night club and guest artists give live performances on Saturday night, in the restaurant. Address: 35 Joel Ogunaike Street, Ikeja, Lagos. Yellow Chilli is located at the center of Ikeja. The restaurant serves delicious Nigerian delicacies including jollof rice, pepper soup, spicy stewed snails, seafood okra, prawn etc. If you desire to have a taste of well prepared and garnished African delicacies, Yellow Chilli is the best restaurant to be. The price of their main dish begins from ₦3,000. Address: 25, Joel Ogunaike Street, Ikeja, Lagos. Opening hours: 6:00 am to 11:30 pm. You can order either intercontinental or local dishes at the Regent Restaurant. The restaurant is not too distal from Jerome’s Garden, Glonik Hotels, and Suites, Wazobia Plaza hotel etc. ₦10,000 is the approximate cost for two persons eating out in this restaurant. The atmosphere of this restaurant is a cool one and the waiters are smart and witty as they promptly deliver your food. This is a beautiful restaurant which offers delicacies like burgers, steaks, barbecues, and pizzas. Other cool features you will enjoy in the restaurant are bar/lounge, Wifi, POS, live music entertainment etc. Withapproximately₦5000you can eat food in satisfactorily in this restaurant. Address: 14C Joel Ogunnaike Street, GRA, Ikeja. For your mouthwatering pizzas and all kinds of fast food, patronize Domino’s Pizza. Domino’s Pizza is notable for excellent services. The pricing of food is quite affordable, the price is within the range of ₦1500 – ₦4000 and you will eat satisfactorily in this restaurant. Opening hours: 8:00am – 12am daily. Browns Café food menu is a long list containing both intercontinental and African dishes which include delicacies like seafood okra, Eforiro, and plantain, Afang soup, lamb chops, French toast etc. You can also get coffee/hot chocolate drinks including light snacks. It has another branch located on Victoria Island. Cost of the meal is between ₦600 and ₦5000. Opening hours: 11:00 am to 10:00 pm. From the name, you’ll know that Jade/Zen garden is a Chinese restaurant which offers you the best of Chinese cuisines. For an amazing Chinese experience, you should try out Jade/Zen garden. The restaurant’s interior decoration is done and arranged in a Chinese fashion. With an approximate amount of ₦5000, you can eat at this restaurant. Those are the Top 10 nice Restaurants in Ikeja. This is not all the restaurants because there are more and you can check them out but for best food experience and service satisfaction you can look up this article and check out any of the restaurants to enjoy yourself. The presence of these restaurants shows how busy and business-like area Ikeja is.